These detached chalets have sleek, modern interiors. There is a choice of five different types of accommodation. There are 6-person chalets, which are perfect for families (NL-1752-10). These feature a spacious living room and a fun cupboard bed. There are also three types of 4-person accommodations; some of these are situated at the edge of the park (NL-1752-09). Depending on the exact location, you'll enjoy either a fine view or the evening sun here. Another 4-person holiday villa, where large patio doors allow you to bring in the outdoors, is NL-1752-11. There are two bedrooms and two bathrooms. The final 4-person chalet is NL-1752-12, which is also equipped with all modern comforts. 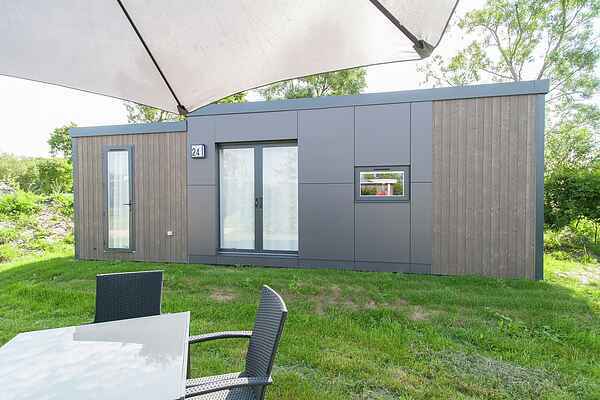 There is also a holiday home suitable for those with limited mobility (NL-1752-13). This features an extra wide entrance and adapted kitchen and bathroom, making this holiday home wheelchair accessible. All chalet types feature a private garden and terrace to enjoy the nice weather. There is room to park one car at your holiday home. Any additional vehicles can be parked in the main parking lot.